It’s finally decent outside. Barring bomb cyclones, hurricanes, and any other inclement weather, it is shaping up to be a pretty spectacular summer. While the actual summer solstice is still a few months off, thinking about your trees in the spring is one of the best ways to ensure that they are healthy all year long. At Tree Tech Tree Services, we can help your trees live their best life. 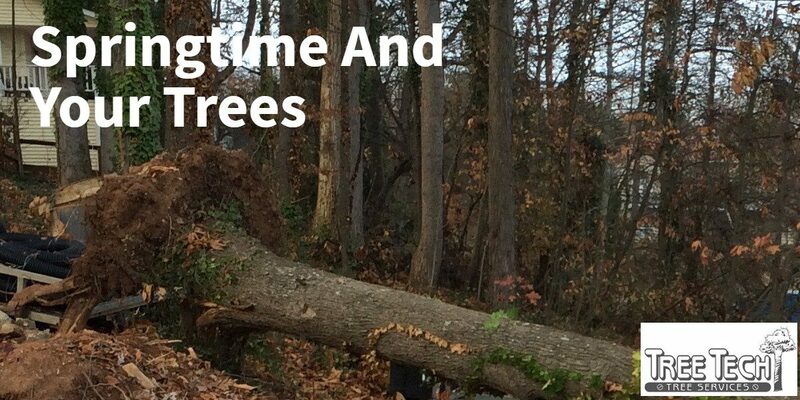 With a certified arborist performing pruning, tree removal, and general tree services, we proudly serve the trees in Mooresville and Huntersville. Generally, most of the pruning you are going to do should be done in the winter, but there is always a case for pruning certain trees in the spring. You will want to avoid making any cuts to many trees in the spring, summer, and fall, however, there are some exceptions. Pruning in the spring can expose the tree to diseases and insect issues, but very light pruning or removal of dead branches is perfectly okay. Fruit trees and those that flower, like dogwood, benefit from pruning once they have bloomed and it may increase production of blooms next year. Of course, never prune trees when they are actively budding, this can kill the tree and leave them vulnerable. Should I Take Down That Tree? Spring is supposed to be a time of rebirth, unfortunately trees sometimes don’t come back from the traumas of winter. You may have noticed branches without the deep leaf cover that they once had, or it may look a little thinner than you remember, in any case your tree may be dying. Trees, like all living things, have their own life cycle, and the life cycle is determined by conditions and care the tree receives. Caring for trees in your yard should include a comprehensive maintenance and care strategy to maximize the tree’s longevity. Trees like elm have a relatively short lifespan while a bald cypress here in North Carolina is estimated to be over 1600 years old. If you are noticing conditions like previously described and are concerned about your tree, don’t fire up the chainsaw just yet, there may be hope. At Tree Tech Tree Services, we can determine if your tree is sick or on the verge of dying. Many times a tree will simply be sick and there are treatments we can utilize to bring it back to health. For instance, many historical trees have been damaged by hurricanes over the years and with advanced treatment for tree diseases and trauma, many have been saved. If you are questioning whether or not your tree should be taken down, the best thing to do is contact the certified arborist at Tree Tech Tree Service. Regardless of your spring chores, taking care of your trees should be one of them. From pruning to treatment and even the unfortunate tree removal, the professionals at Tree Tech Tree Service are here for all of your needs. Please contact us today for more information.